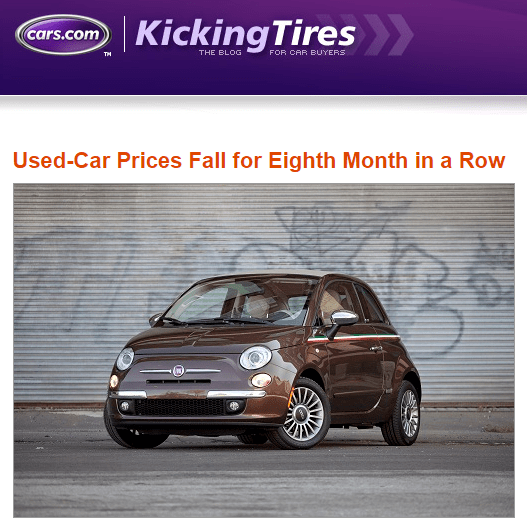 This article is a reblog of the Cars.com blog post titled Used-Car Prices Fall for Eighth Month in a Row on their "Kicking Tires" blog site. We delve deeper in to what that means for consumers and dealerships alike below. If you reached this page in error and instead are looking for more information or to purchase a car our World Class Internet Department can be reached at (800) 680-0835 or with this form. Brianna recently tipped me off to an article she found interesting on Cars.com’s blog. According to the article (and Cars.com’s massive knowledge and database for new and used car prices) used car prices continue to fall for the eight month in a row in December of 2014. However, the prices of some used vehicles, particularly used luxury cars, have gone against the tide and seen values increase. Now, we’re not talking about ALL used vehicles here but mainly late model (i.e. 2011 and newer) used vehicles are following this trend as of the bulk of last year. But what does that all mean? Much like dealerships this is both good and bad news for consumers looking to trade their current vehicle or purchase a pre-owned car. Looking to trade your vehicle in? With market prices falling your vehicle will depreciate faster than usual so it’s better to trade sooner than later. If you’re looking to purchase a luxury pre-owned vehicle the dealerships tend to have the advantage right now as their vehicles are appreciating (however, when they feel they can make a decent profit a dealership would be insane to hold on to a vehicle and refuse deals. A) they’re not museum’s and B) and can seriously damage their reputation to turn business away). This is even worse news for people looking to trade in a non-luxury vehicle for a pre-owned luxury vehicle as your vehicle as the gap between values has widened. However, anyone who currently drives a luxury pre-owned vehicle and has their eye on a non-luxury vehicle is in a great place to trade right now. If you’re in a big city (or near any or our Autostar locations) you won’t be affected quite to much as larger dealerships tend to sell their vehicles faster than small ones so they’ll catch up to the changing market conditions rather quickly. If you’re in a small town area than expect the smaller dealers (both used and new car dealerships that sell used) to lag behind in changing their prices. However, thanks to our unique operating model there’s never been a better time to purchase from Autostar USA! Whether you’re near or far our World Class Internet Department is more than capable to help you leverage the current market in purchasing your next vehicle. Contact them today at (800) 680-0835.